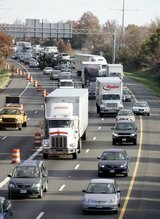 Truck drivers are expected to descend on the Beltway on Friday for a political rally protesting causes ranging from the government shutdown to low wages for drivers — but claims the group planned to intentionally clog the roadways and shut down the region appear to have been overstated. Kicking off with a rally and drive around the Beltway on Friday morning, the group is encouraging a wider general strike that would last through the weekend. Organizers encouraged truckers not to haul freight and asked supporters not to purchase any products or services that aren’t completely essential.